Basilar invagination and Basilar impression (we will use the term BI for both) are uncommon syndrome that occurs when the superior part of the odontoid (part of the C2 vertebrae) migrates upward. For the most part, the terms basilar invagination and basilar impression are often used interchangably because in both cases there is upwards migration of the upper cervical spine, but precisely, basilar invagination is defined as upward displacement of vertebral elements into the normal foramen magnum with normal bone, while basilar impression is a similar displacement due to softening of bones at the base of the skull (Smoker, 1994). Thus different terms are used according to whether bone is normal or not. Platybasia, is a related term, indicating an increase in the basal angle of the skull -- basically a flattening of the base of the skull. Platybasia is diagnosed when, on a lateral skull film or saggitally formatted CT, the angle of the line drawn along the plane of the sphenoid sinus and along the clivus is greater than 145 degrees. Platybasia, per se, is not a disease. BI is uncommon but somewhat dangerous. It occurs both congenitally (i.e. basilar invagination associated with Down's syndrome, Klippel Feil syndrome, Chiari malformation (25-35% of BI), ) and in persons with bone diseases (basilar impression), such as rheumatoid arthritis (also called cranial settling), hyperparathyroidism, Paget's disease, Osteogenesis imperfecta (also associated with hearing loss from otosclerosis), Rickets, Hurler's syndrome, and Hadju-Cheney syndrome. It may lead to static or dynamic stenosis of the foramen magnum, and compression of the medulla oblongata (lower brainstem). It can manifested as sudden death due to fatal brainstem compression, but more often it is asymptomatic. Basilar invagination from rheumatoid arthritis is due to loss of axial supporting structures in the upper cervical spine. It is estimated that about 10% of patients with rheumatoid arthritis are at risk for sudden death, but in reality, this seems to happen very rarely. Obstructive hydrocephalus or syringomyelia may also be seen because of direct mechanical blockage of normal CSF flow. Our experience in our otoneurology practice has been that this is an extremely rare condition, with symptoms (if any at all) elicited by head extension (see figure below). We are not sure why our experience differs from that reported. A C2 sensory deficit should be looked for. Patients may also present with a "pseudo-ulnar hand," with tingling and numbness in the 4th and 5th digit, and tingling and numbness in the medial forearm. Patients will go into a pool and notice that below the umbilicus the water is not as cold as it above (this suggests central cord disease). Lhermitte's sign (a tingling on neck movement, flexion in this case) can be demonstrated at any stage. MRI read as showing mild basilar impression and platybasia. This patient developed a violent vertigo and convergence, reproducibly provoked by head extension. Lateral skull film showing Chamberlains line (between the posterior end of the hard palate to posterior lip of foramen magnum). This patient has obvious downbeating nystagmus, and a "pseudoulnar hand". She also has Rheumatoid Arthritis. 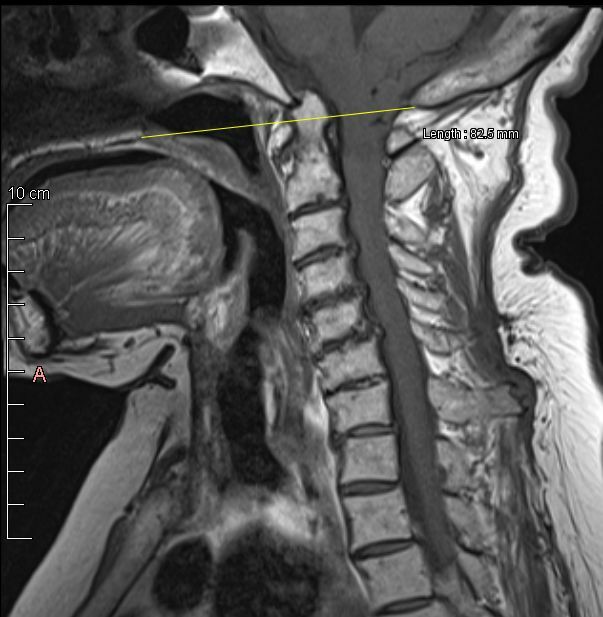 Same patient, showing MRI of Cspine. Here it can more easily be seen that the top of C1 is about 1 cm above Chamberlains Line. A plain lateral x-ray, with odontoid views, is a good place to start, but is not 100% sensitive (Riew, Hilibrand et al. 2001). Chamberlain's line is drawn between the posterior hard palate to the posterior edge of the foramen magnum. If the dens is more than 3 mm above this line, the patient has basilar invagination. We sometimes find it hard to find the odontoid on lateral skull films, and have much less problems on sagittal MRI's (see two images above). CT scans are also much easier to read. McGregor's line is the line drawn from the posterior hard palate to the base of the occiput (lowest point). If the dens is more than 4.5 mm above this line, again basilar invagination is diagnosed. There isn't much difference between these two lines -- but McGregor's is easier to use as there is no judgment needed to find the posterior lip of the foramen magnum. McRae's line is the opening of the foramen magnum. 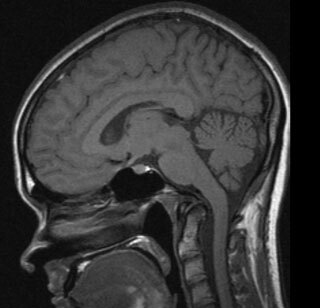 For this one, we think one really needs a sagittal CT. See this page for more. Flexion extension MRIs have a higher yield. A plain CT scan with saggital reconstructions can also document this, but MRI provides more information. Somatosensory evoked potentials (SSEPs) may have false positives, and in our opinion, are not indicated. VEMP testing has not yet been explored in BI but seems promising. Neurosurgery is recommended when neurologic symptoms and signs are present, and cord compression is confirmed by MRI. When these features are absent, a conservative approach may be pursued, such as a collar, nonsteroidal anti-inflammatory drugs (NSAIDs), and simple neck traction. In patients who are considered poor surgical risks, neurologic progression is likely and the one-year prognosis is poor. Neurosurgical treatment is quite difficult. In the series of Sawin and Menezes (1997), they suggest that ventral brainstem compression should be treated with ventral decompression, followed by occipitocervical fusion with contoured loop instrumentation to prevent further squamooccipital infolding. In persons with Chiari malformation, there may also be occipital decompression surgery. Ventral decompression means operating through the front of the head, through the mouth. Both the transoral and posterior surgery can be done in one sitting (Zileli and Cagli 2002). Another approach is atlantoaxial joint distraction and direct lateral mass fixation using screws (Goel, 2004). In the one patient of ours who underwent ventral decompression, it appeared to us that this was an "heroic" procedure, that occupied many hours, and resulted in an outcome that was not at all desirable. 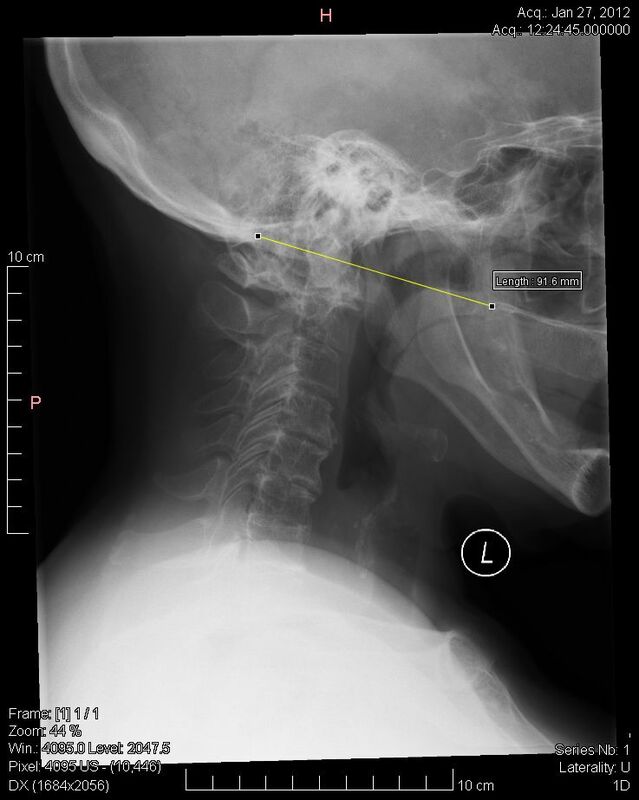 The occipitocervical fusion resulted in a head that is largely immobile. Another of our patients decided to "live with" her symptoms. While she is very impaired, on the whole, we think she did better than the first. In other words, just because one can do surgery, doesn't mean that it is the best choice for Basilar Impression. Atlantoaxial subluxation (AAS) is a related problem to basilar invagination. AAS can occur anteriorly, posteriorly, vertically, laterally, or in combinations. Movement of the axis anterior to the atlas (greater than 3mm from the arch of C1 and the odontoid) results from transverse ligament laxity/destruction, or odontoid process erosion/fracture caused by invasive rheumatoid arthritis. Cord compression is more likely when the subluxation exceeds 9mm. In most cases, subluxation less than this is asymptomatic. Lateral x-rays taken in extension and flexion are used to demonstrate AAS. Indications for surgery include neurologic abnormality with instability, intractable neck and head pain, vertebral artery compromise, and cord compression on MRI (even without symptoms). The most common surgical procedure for anterior C1-C2 subluxation is posterior fusion by internal fixation of C1-C2. Goel, A. (2004). "Treatment of basilar invagination by atlantoaxial joint distraction and direct lateral mass fixation." J Neurosurg Spine1(3): 281-6. Pratiparnawatr, P., S. Tiamkao, et al. (2000). "Downbeating nystagmus and postural hypotension due to basilar invagination." J Med Assoc Thai83(12): 1530-4. Riew, K. D., A. S. Hilibrand, et al. (2001). "Diagnosing basilar invagination in the rheumatoid patient. The reliability of radiographic criteria." J Bone Joint Surg Am83-A(2): 194-200. Sawin, P. D. and A. H. Menezes (1997). "Basilar invagination in osteogenesis imperfecta and related osteochondrodysplasias: medical and surgical management." J Neurosurg86(6): 950-60. Zileli, M. and S. Cagli (2002). "Combined anterior and posterior approach for managing basilar invagination associated with type I Chiari malformation." J Spinal Disord Tech15(4): 284-9. We thank Dr. Jeff DeSanto for correcting the definitions of Basilar Impression and Basilar Invagination.